One of the biggest home decorating trends for 2019 is….comfort! More and more people are seeking warm colors and intimate spaces, and are choosing to add casual touches to their sophisticated lifestyles. We have several suggestions for achieving this look, but you don’t need to put your house through a major renovation. Simply making one or two changes can rid a room of it’s “look but don’t touch” vibe and instead invite your family or guests to settle in and get comfortable! Smaller Furnishings – Large furniture pieces and open spaces have long been in favor, but many consumers are now longing for cozier environments. To achieve this, designers are suggesting smaller pieces arranged in more intimate settings. 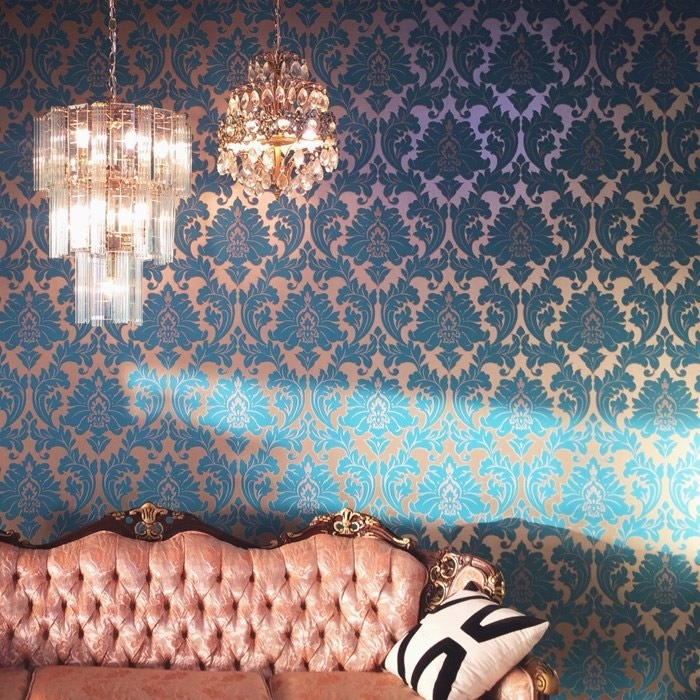 Wall Coverings – Believe it or not, wallpaper and fabric wall coverings are back! You can expect to see plenty of deep red, green and gold shades, in rich designs that convey warmth and a sense of cozy opulence. If you aren’t ready to make the wallpaper commitment, this look can still be achieved by painting a room in the same rich colors. ‘Pops’ of Color – Say goodbye to beige and white minimalism and instead jump all in with fun colors, especially in family-friendly spaces like kitchens and informal family rooms. Yellow is the hottest color for small accent pieces–from ceramics to lamps to sofa pillows. Meanwhile green is all the rage for upholstery patterns and kitchen furnishings. Traditional Styles – Antiques and even second-hand items are having their moment again, in a trend that is both cozy and eco-friendly. Think skirted tables, wooden chests and wooden frames for mirrors and historical prints. Fireplaces – Recently fireplaces have played second fiddle to the entertainment centers and mounted televisions as the focal point of family rooms and dens. A fireplace, working or not, provides far more welcoming ambiance. Simply rearrange your furniture in a sitting room or den to reclaim a homey hearth as a nice spot to gather. Outdoor fireplaces are popular as well, giving a summer cookout feel to your outdoor space year round. Get comfortable in a new home in 2019 – check out our featured listings here!